Michigan has a world class year round fly fishery. Yes, even winter fly fishing. The Manistee, Pere Marquette, Au Sable and other Northern Michigan Rivers all offer winter fly fishing. 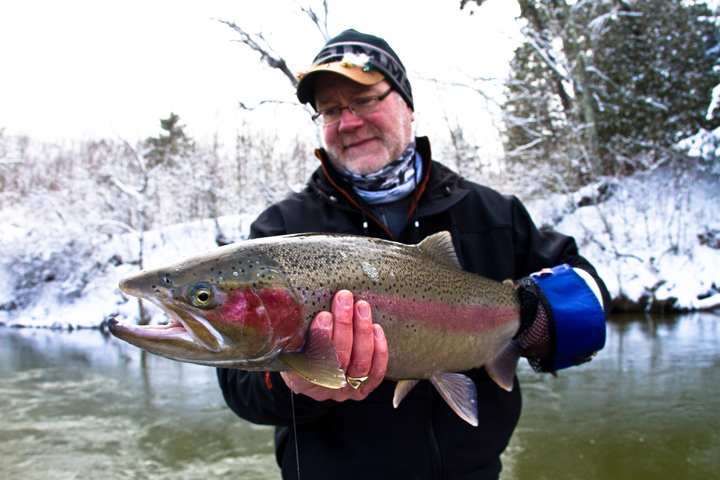 Resident trout and our fantastic Great Lakes steelhead, provide us with ample fly fishing opportunities in winter. Fishing in winter?? You probably think I’m nuts. That’s far from true. A few additional levels of preparation to keep you safe and comfortable (warm) and you can be on the stream catching fish. Probably the less adventuresome anglers are at home dreaming of opening day. 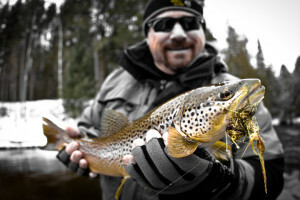 First and foremost you need to stay warm and dry while winter fly fishing. To keep your feet warm when wading I recommend boot foot waders that are not too tight. You need circulation in your feet to keep them warm. I use the chemical heat packs between two socks to help keep my feet warm on very cold days. If I’m fishing from a boat I don’t wear waders at all. I use Bogg insulated boots to keep my feet warm. My favorite gloves are fingerless. I carry two or three pairs of gloves so that I can replace them if I get a hand wet holding a fish for a photo. I’m a fan of cold weather wading pants, with down insulation working the best. In addition I wear capilene long johns (on extra cold days), a couple of lightweight wool pullovers and a wind proof jacket. Finally I wear a hoody under the jacket also. This outfit allows me to fish in temps well below freezing in comfort and safety. You can find a variety of these types of clothing products at Orvis and Patagonia. They make it very easy to get the correct layers you will need for the temperatures that your going to fish in. Also one of the best pieces of clothing is the neck gator or Cyclone Buff. The most difficult areas of the body to keep warm are your head, feet, and hands. The gator helps the neck and heater packs inside of the proper boots and gloves take care of feet and hands. By keeping warm you will be able to stay out all day long. If you are on a guided trip with us you can skip the waders and use a warm, comfortable boot like a Snow Pak type or the Boggs mentioned above. If you go that route make sure that you have a waterproof outer layer in the event of snow or rain. Now that you are ready where do you look for fish and how do you catch them? Look for winter steelhead in slower water, woody areas, and spots that offer some shelter from the current. Because their metabolism is slow they avoid heavy currents. Seems like they favor areas that offer security and comfort. Seams in slower water created by structure are prime lies and should always be checked. The most common method we use in winter on the Manistee, Pere Marquette and other rivers is Float Fishing. It is producing very successful results. Eleven foot switch rods, long leaders and egg flies and beads are giving us fantastic results. On smaller water we use more standard strike indicator nymphing. It is a very satisfying way to catch steelhead. Use the same method that you use to catch trout during the summer just use bigger equipment and heavier leaders and tippet. In winter this method is deadly on the Pere Marquette River in the slower moving pools where steelhead lie. Don’t be surprised when you catch trout on these rigs also. 90% of the time we fish egg patterns, primarily clown eggs and beads in a large variety of colors. I carry a couple of sizes, the size of my thumbnail and of my little fingernail. Pick the size based on water clarity. Other than eggs some black stones should be in your arsenal because those bugs can get busy along the bottom this time of year. Also fluorocarbon can pay big dividends during the winter as water clarity is almost gin clear. I carry 6, 7, and 8 pound test Sniper from Sunline. More about this in the future. Swinging for steelhead in the winter can be productive, if you bring the correct mental attitude. Short spey rods, with shorter length lines, with smaller heavier flies is the key. Your fly needs to get down quickly, you will need to keep your fly in the zone and moving slow. Just remember you are asking a fish to chase down your offering, when the water temps are the coldest of the year. When you swing in the winter, it is not uncommon to find the largest most aggressive fish interested in your offering. This is not a how many approach, but I wonder how “big” approach. Try dark based patterns similar to the DV Sculpin. Resident trout will also bite flies in the dead of winter. Look for trout in softer, more sheltered water than in warmer water temps. Slow down your retrieve, many times almost just a jig back to the angler will work. Because of that retrieve I’m partial to cone heads and dumbbell eyes on the flies I use. That gives the fly that great up and down motion on the way across the river. Also most of the time smaller flies out produce bigger profiles. I particularly like certain stretches of river in winter. The Holy Water on the Au Sable, Manistee below Tippy (check out the below tippy video), and others can provide great action on a nice winter day. First of all make sure to check your regulations, to make sure the section you want to fish is actually open. But now with so many more miles of water open for winter exploration year round trout fishing can be experienced easily. Finally when you notice, on the extended weather report, a nice couple of days, and your calendar shows that you can get away, give us a call. We will pencil you in for a great day winter fly fishing for steelhead or drifting a nice stretch of river hunting a big ole winter brown trout. If the weather doesn’t hold we don’t go, if it does you will have a great time.